i b i k e l o n d o n: Lick your LIPS; it's time to get the City to listen to cyclists! Lick your LIPS; it's time to get the City to listen to cyclists! Do you ever ride along a certain stretch of road and think 'This is so poorly designed, I could do better than this? ", or swing out around a traffic calming island and exclaim "Who on earth thought this up? Didn't they think about bikes before building this junk?!". As cyclists I'm sure we've all been there, and sighed in exasperation as we've cycled on, wondering why our streets aren't more cycle-friendly. We all know that 'Smoothing Traffic Flow' includes things like removing pedestrian crossings, or indeed scrapping the Western Extension of the Congestion Zone. Us cyclists can forget about that for just a minute. What should really get us interested is 'improving interchanges' (by far the most dangerous area for cyclists in the City' and of course 'the cycling revolution'. The actual result was 2.6% of all journeys. And the City did virtually nothing to reach that 12% target, it seems to me, other than wonder why the number of cyclists being killed on its streets was rising. To be fair, we have some more contraflow streets where bicycles can now travel in two directions. And that's a huge step in the right direction. But it's not enough. In Paris, almost every single one way street is now two-way for bicycles. In Berlin there are 250km of these streets (not to mention 400km of segregated bike lane). In the City, we have a few streets." Despite their written commitment to 'the cycling revolution', it doesn't look like they City will achieve that 10% modal share for cyclists this time round either. Why? Because they have only allocated 0.45% of the City's planned budget to cycling. Sure, we'll get a few new cycle stands, or maybe even a few painted cycle lanes, but no coherent master plan incorporating A-grade excellent facilities. To be frank, any bonus to cycling brought about by this 0.45% budget spend is likely to be cancelled out by the City's insistence on narrowing streets (see here) and building more 'shared space' in unsuitable locations. As one local source confided to Cyclists in the City, with the current financial allocation "We'll be able to build a handful of new contraflows". 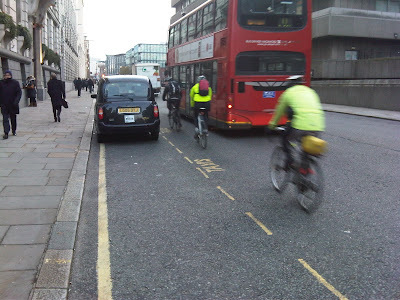 One thing I dream of on this blog is a truly cyclist-friendly London where everybody can feel safe on two wheels, and I know many of you who come here and share your thoughts and comments often wish for the same, dream of mass cycling levels, and frequently feel frustrated with the way in which local authorities seem to conspire against these ideals. Indeed, I've even been called a dreamer for daring to demand better but here's the perfect opportunity to hold a cash-rich borough to account and get them to truly put cycling first. The fact that it's the very centre of London and is criss-crossed by many thousands of cyclists every single day makes it even more important. I don't see why it's fare or appropriate for the City to spend just £528,000 on their cycling revolution programme over 3 years when road danger reduction gets £780,000 (which in the City seems to consist mostly of their police stopping RLJing cyclists, as oppose to chasing after speeding drivers), and major public space projects are allocated a whopping £30million - public space projects, like Cheapside and St Paul's Churchyard where cyclists are the highest volume of road users and yet have to contend with new street designs which make riding a bike more difficult or dangerous. So, how do we go about changing this situation and getting our voices heard? Well, we could hope in earnest that the London Cycling Campaign will do their bit and wake the City up, but sadly they've been strangely, awfully quiet on the issue - the last correspondence I had from them was asking me to try and recruit more members to 'double their numbers', as oppose to being about anything so concrete as what we are discussing here. Besides which, a broad statement from a campaigning group is not what the City of London needs to hear in order to change their ideas - they've admitted as much that in order for the LIP not to be waived through Council without any amendments they'd need a mass response from individuals who live, work, or travel through the City (which must be just about anyone crossing London at any time, right?). Danny has an email you can send to friends and colleagues or your local cycle group with plenty of back up information, plus a draft email and a list of Councillors whom to send it to, which you can amend to include your own ideas and experiences. I know its a bit of a struggle to take some time out of our busy schedules to pen letters to Councillors who probably don't even fully grasp the issue, but if it is to be, it's to be me (and you, and you, and you!) As I said at the start of this blog post, the nust and bolts of it all are unnervingly yawnsome, but the potential of what is at stake is most certainly not. 1) if there's any way to get couriers vocal about this? 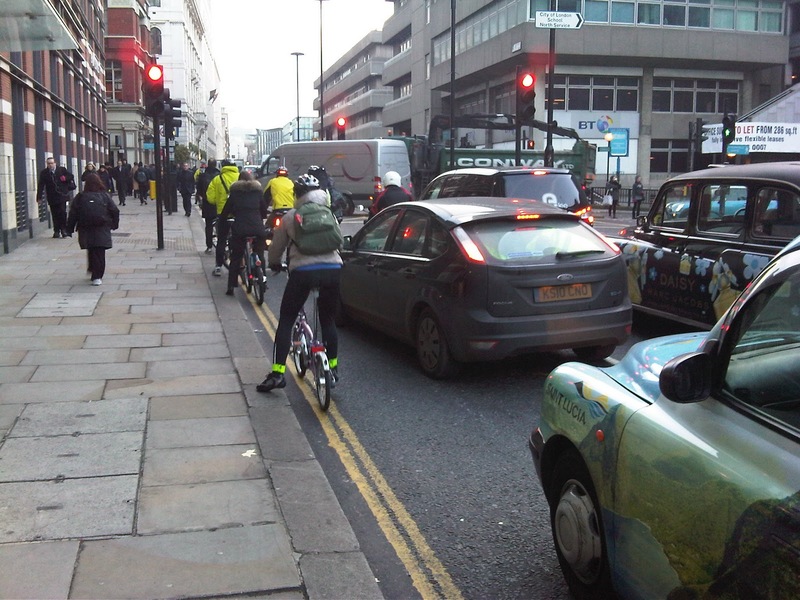 If there's any one group that has a lot of information/experience about problem roads/intersections, I imagine it would be the people whose job it is to bike all day in the City of London (and other places). Getting a repost on Moving Target/LFGSS would be a start. 2) What about trying to get bike shops in the city centre involved? Any of their patrons are target audience for this. I totally agree that the couriers know the worse intersections all too well - I'll pass this post on to Moving Target and put it up on LFGSS - don't know why I didn't think of this before. As to the bike shops, I also think this is a great idea - when Danny publishes his draft letters and lists of Councillors to send them to we should definitely get them involved! You're right to encourage all cyclists in London to take an interest in Local Implementation Plans because these are crucial in determining how councils will spend taxpayers' money. You must have missed London Cycling Campaign’s article on LIPs in last August's London Cyclist magazine, which alerted many cyclists to the LIP process. LCC's strategy was to try to influence the LIP process before the draft LIPs were put out to public consultation. We were also happy to provide Danny (an LCC member) and other City cyclists with input during last year's lobbying efforts. Now that the LIPs are out there for public scrutiny, we recommend searching for 'cycle', 'cyclist' and 'cycling' in the documents to quickly see what commitments your borough is making. There should at least be commitments to cycle training, cycle parking, one-way streets, and reduction of road danger – if these are missing ask why. Boroughs must also include a target for the increase in cycling, and this is supposed to be in line with the Mayor’s target of a 400% increase from 2001 to 2026 (to give a modal share of journeys of 5%). This is way below what London could achieve with the right policies, of course, but at least it means boroughs have to include cycling growth in their plans, and it makes it easy to question whether this is ambitious enough. Thanks for stopping by and sharing this further insight in to the murky but important depths of the LIPS process - it is very much appreciated, and they are some great tips. I apologise if my comment regarding the LCC seems rude - it's not intended that way, more that I was somewhat exasperated that it seemed to be down to a blogger (who happens to also be an LCC member - that makes two of us) to be really pushing the envelope on this subject. That you've had to explain where to find LCC's response to the LIPS process speaks for itself. Squabbles aside, I wholeheartedly agree that the LIPS process is very important; commitments to cycle training, parking etc etc are the very bare minimum I expect from our boroughs. My philosophy is dream middle, ask big and get small. If we ask small, we'll get tiny. To this end, I am right behind Danny's campaign to really push the City to raise their game. With regards to the other Boroughs, perhaps the LCC and it's local groups could put together a summary of how the processes are going, what sort of percentage allocation of budgets is happening and what modal %s each Borough is pushing for.